As transit ridership dips and vehicular congestion worsens, some smart cities are turning to electric scooters to alleviate traffic and make commuting easier. Traffic does more than make it difficult to get to work in the morning. According to a study from the transportation consulting firm INRIX, vehicular congestions cost the US $305 billion in 2017. With that number having risen $10 billion from 2016, it also seems like the problem is only getting worse. Thankfully, cities committed to supporting their 21st-century workforce are investing in solutions. For starters, urban governments are directing resources toward improving their mass transit systems, with traffic-prone cities such as Los Angeles launching large-scale expansions of underground rail infrastructure. In New York City, updates for an ailing subway system might be partially funded by a congestion tax, meant to alleviate traffic on the surface in turn. While redesigning mass transit is a necessary step toward more livable cities — especially as the global urban population continues to grow — it may take years or even decades for that impact to be felt. In the meantime, sharing-based transportation solutions are taking off. 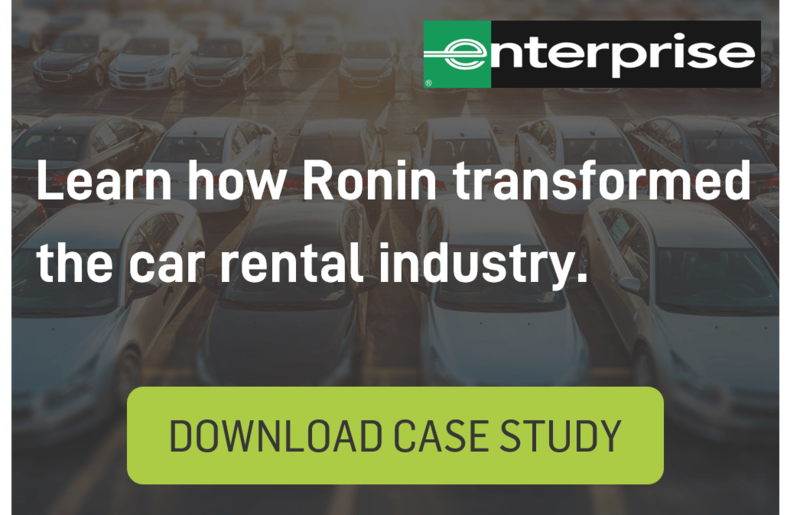 From Uber and Lyft to Zipcar and Kangaride, ride-shares have become a popular means of getting from point A to point B. Lately, however, a new offering has appeared on city streets: scooters. Scooter-sharing programs — Bird, Lime, and Skip among them — are taking to the streets to offer commuters, visitors, and residents a quick, easy, and affordable way to move around cities. While kinks still need to be worked out, their surging popularity indicates that they might be here to stay. And for cities battling congestion, that may be a good thing. For anyone who regularly spends hours caught in traffic, the experience can be harrowing. The byproduct of over-population and outdated urban design, congestion represents an economic and emotional drain for cities, businesses, and residents alike. 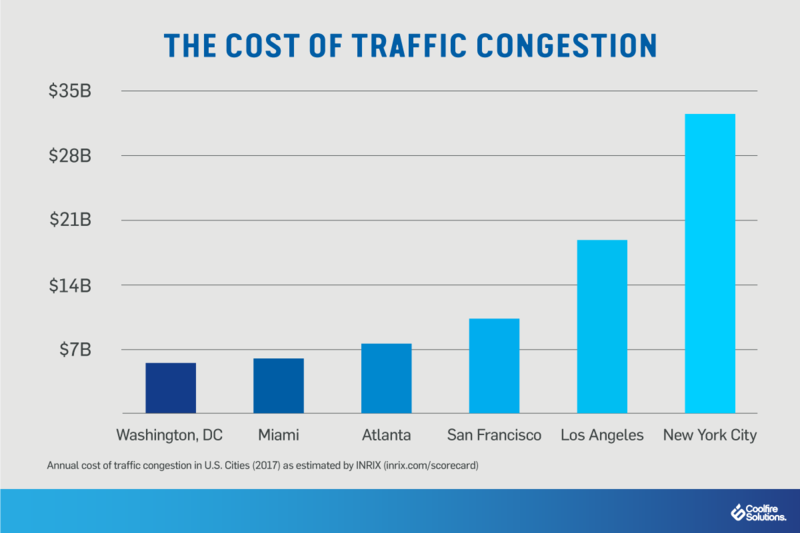 Indeed, the INRIX report totaled just how much congestion costs different cities. While Los Angeles drivers spend the most time caught in traffic — 102 hours per year — New York City suffers the worst economic burden with $33.7 billion lost to congestion. Regional cities aren’t spared, however, with places like Atlanta, Miami, and Boston all seeing traffic costs that average more than $2,000 per driver. While these figures are staggering, they don’t account for the numerous ways in which congestion exacts an emotional toll on the people caught up in it. For those who spend well over a full work week’s worth of time every year caught in traffic, stress is an unfortunate side effect. And research suggests that that stress can even lead to higher crime rates. As cities become more crowded, this stress may contribute to residents’ dissatisfaction with where they live. Like the first wave of ride-sharing platforms such as Uber and Lyft, scooter-sharing programs have become immensely popular in a short amount of time. This is both exciting for residents who are looking for cheap transportation solutions and challenging for city governments that need to balance innovative technology with regulatory hurdles. While cities are generally positive on this route toward decongesting roads, there are concerns. For instance, the scooters have been getting a bad rap for irresponsible riders using them without helmets, riding them on sidewalks — which is prohibited — and leaving them on the curb instead of in more pedestrian-friendly locations. However regulators feel about the scooters, it’s clear that they’re making a splash. 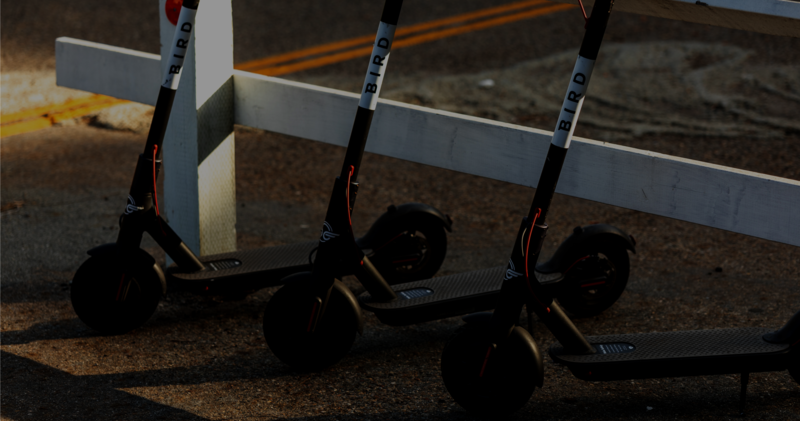 Bird reported that, in its first month of operation in San Francisco, more than 32,000 riders used their scooters, resulting in 95,000 rides that totaled a collective 143,000 miles. As these services become more popular in other cities, ranging from Santa Monica and Los Angeles to Washington DC and New York, it’s up to cities to make common-sense laws and launch open-minded pilot programs to understand how e-scooters will fit into their urban ecosystems. In order to make the most of this trend, private scooter companies and public institutions alike will need to collaborate to achieve the best possible outcomes. For example, cities can work with scooter companies to approve charging locations, drop-off areas, and rules for riders that protect pedestrians, drivers, and scooter users alike. A large part of this effort will rely on an emerging technology called situation awareness. With situational awareness platforms that can provide real-time insights into the stock of available scooters, their location relative to users, and their charging status, it’s possible for stakeholders to have a better handle on what usage looks like while giving riders updated information as they try to navigate urban congestion.